In popular culture we live and move and have our being. This observation by theologian Robert Banks is hard to argue with since American society has very little of what has historically been called high culture. In agreement, someone else pointed out that without popular culture we would not have any culture at all. Fact is, we’ve been popcultured! But the church rarely addresses popular culture even though its many forms shape both the Sunday and weekday expressions of the Christian faith. This void is addressed by journalist, writer and poet Steve Turner in his recent book, Popcultured: Thinking Christianly About Style, Media and Entertainment. While helping lead a couple classes in his church, “Christianity Explored” and “Discipleship Explored,” Turner wondered why the church never had a class called “Exploring Popular Culture.” Having spent his life working in popular culture—interviewing rock stars, writing for Rolling Stone, penning a biography of Johnny Cash—Turner decided that it was time to provide help in making sense of popular culture from a Christian perspective. The first chapter of Popcultured focuses on why Christians should care about popular culture: “What has popular culture to do with Christian faith?” Turner provides ten reasons for asking this question. 2. The second reason for asking the question is because people often make popular culture with the intent of altering perceptions. This attitude seriously underestimates the intelligence and the motivation of those who create popular culture. These creators aren’t children doodling with crayons. Predominantly they are trained people with a deep knowledge of their chosen art form and its history. … There’s something about the status quo that irritates them and they want to put it right. Sometimes they are people who enjoy subversion—reeling people in with wholesome looking entertainment and then zapping them with a message that runs counter to expectations. 3. The third reason is popular culture is a great gift to us and we should therefore take it seriously. 4. A fourth reason is that the Christian view is that Christ is the Lord of all life. That is the definition of discipleship. He wants us heart, mind, strength and soul—the total package. That means that there is nothing we experience that Christ doesn’t have a claim on and doesn’t have something to say about. 5. The fifth reason for asking the question is because most of us spend a good proportion of our lives having our thoughts prompted by popular culture. Through the day we may watch the news on TV, check out social networking sites, buy new clothes, read a newspaper or magazine, read ads tweet or text or play an online game. In the evening we may watch a TV drama, soap opera, reality show or talent show, spend time on the Internet, read a book or listen to music. On the weekend we may watch a movie, go to a play, dance, skateboard or attend a concert. 7. A seventh reason is that because popular culture is a place of debate and negotiation, it gives us examples of how our contemporaries are thinking. We do well to know the popular culture of our times because there we have the stories, the poetry and the idolatry of our times. It makes sense to illustrate a point by appealing to the dialogue from a film, lines from a song or comments from a popular culture icon, because they’re familiar to the contemporary audience. These examples establish a common ground for discussion. The space in people’s brains that would once have been filled with stories from the Bible and verses from hymns is now full of stories by screenwriters and lines from lyricists. 8. The eighth reason is that unless we first pay attention to popular culture, we have little chance of successfully contributing to it. 9. A ninth reason is that God can address us through popular culture. He can use songs to encourage us, movies to deepen our understanding of ourselves, biographies to inspire us, television to educate us, journalism to inform us. We are able to pray in a more compassionate way because of news gatherers, marvel at creation more deeply because of nature photographers, feel less isolated because of songwriters, build more communities of like-minded people because of the Internet. Truth is truth whoever may say it …. 10. A tenth reason for Christians to ask the question is because people who don’t accept spiritual realities are responsible for most of the serious academic exploration of popular culture. What seems remarkable (given our Christian heritage) is that none of the leading schools of cultural theory in the West [Marxism, postmodernism, feminism, etc.] start with a biblical view of humanity or even seem to consider a spiritual dimension, and none of the key theoreticians has been religious. If Christians got involved in such scholarship they could raise questions that aren’t currently being asked and add a disquieting voice to the ongoing debate. It would be nice to think that future textbooks surveying all the cultural theories currently on offer would be forced to appraise distinctly Christian contributions. 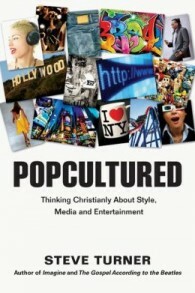 Steve Turner’s Popcultured: Thinking Christianly About Style, Media and Entertainment was published in 2013 by InterVarsity Press. Turner is a writer and poet living in London. As a journalist, he has written for Rolling Stone and The London Times. His many books include Conversations with Eric Clapton, U2: Rattle and Hum (co-author), Van Morrison: Too Late to Stop Now and A Hard Day’s Write: The Stories Behind Every Beatles Song. He has also written biographies of Marvin Gaye and Johnny Cash. I look forward to joining you this summer in discussing this wonderful topic.